Riverford Organic grows and delivers award-winning fresh organic fruit and veg boxes straight from the farm to homes around the UK. Riverford Organic franchise delivers fresh organic produce to local people by the most direct route possible. 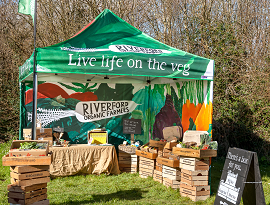 Having won a multitude of awards including the Observer ethical product of the decade 2015, Riverford Organic is a full member of the British Franchise Association. The Lancashire franchise commenced trading in 2012 and grew initially with a strong focus on Blackburn, Ribble valley and Burnley. The business has developed since with an outlook of excellent customer service, both in delivery and support, as well as high levels of organisation to ensure customer requirements are met. Currently deliveries are made to between 420- 450 households a week using 2 vans with the occasional need for a 3rd vehicle –rounds have recently been re-organised to improve efficiency and make better use of larger vans. There is a high quality, engaged customer base with over 800 customers having received a delivery in the last 3 months. In 2015 the territory was expanded to include areas in the West, making it geographically one of the largest delivery areas. In addition to this there are still postcode sectors that haven't yet been opened, offering strong potential for future growth. The territory incorporates rural countryside, a mix of independent towns such as Blackburn, Preston and Burnley, affluent towns/villages in the Ribble valley such as Clitheroe, Waddington and Bolton by Bowland and East coast towns such as Lancaster, Blackpool and Southport. Daily deliveries are collected from the hub in Burnley, which is conveniently located on the M65 corridor providing good access both East and West. There are plenty of opportunities throughout the area to build on the existing customer base utilising shows and events such as The Clitheroe food festival which is now one of the biggest one-day food festivals in the country. Other shows include Lancaster, Preston, Southport and Blackpool. There remains plenty of potential to develop the customer base further across the whole area as there is a growing network of local artisan/maker markets that has so far been untapped. There is also a strong food culture particularly around the Ribble valley and Preston whose residents are most likely to support independent food businesses and are ideally suited to Riverford marketing. With an asking price of only £65,000 and a 12-month turnover of £407,111 this territory offers a great opportunity to run an ethical and rewarding franchise, in a sector that is currently worth over £2.2billion*.